The Cyber Intelligence 12-Month Online Subscription Program is designed to guide organizations in their cyber and threat intelligence program builds through online lectures, demonstrations, and templates covering a wide range of topics. After years of teaching intelligence courses and delivering intelligence programs to clients, Treadstone 71 now offers the subscription-based, automated program guiding clients through the strategic planning process, goals and objectives creation, maturity assessment, SOP development, threat intelligence platform selection, collection planning, intelligence analysis, analytic writing, and dissemination non-inclusively. Treadstone 71 is now offering the same quality in-person courses but in an online format. The Cyber Intelligence Tradecraft Certification online course is geared to accommodate times for students globally. Meaning, office hours for discussions, questions/answers will vary weekly from 6 AM Eastern Time to 6 PM to 9 PM (as examples) Eastern time based upon locations of enrolled students. Office hours will not be the same weekly unless all students happen to be from a specific time zone. As the U.S. and U.K. send an unprecedented warning on Russia's global cyber attacks, security expert Jeff Bardin, chief intel officer at Treadstone 71, tells BNN Canada is also at risk. Jeff Bardin, Chief Intelligence Officer at Treadstone 71 joins BNN to provide perspective on the latest in the Uber saga: the concealed data breach that has the company cleaning up. Treadstone 71 assists you in your Threat Intelligence Platform selection process. Based upon a foundation in intelligence community tradecraft, security operations, and threat intelligence, we craft a structured analytic techniques method to TIP assessment. Our workbook and methods are used for the review and completion of the questionnaire by the vendors and by TIP participants. Completion of the Treadstone 71 workbook is required within 5 business days after receipt and may only be shared with the client and point-of-contact for the TIP evaluation. Implementing the Strategy section provides broad organizational guidance to meet the Treadstone 71 TI Team’s requirements. Treadstone 71 Cyber Intel Training 2018 Treadstone 71 developed a maturity model to help organizations determine the maturity of their cyber intelligence initiatives against the cyber intelligence common body of knowledge (CICBOK). The model provides strategic and operational aspects of your cyber intelligence maturity, where it needs to go, and where you should concentrate your attention to create more value for your business. 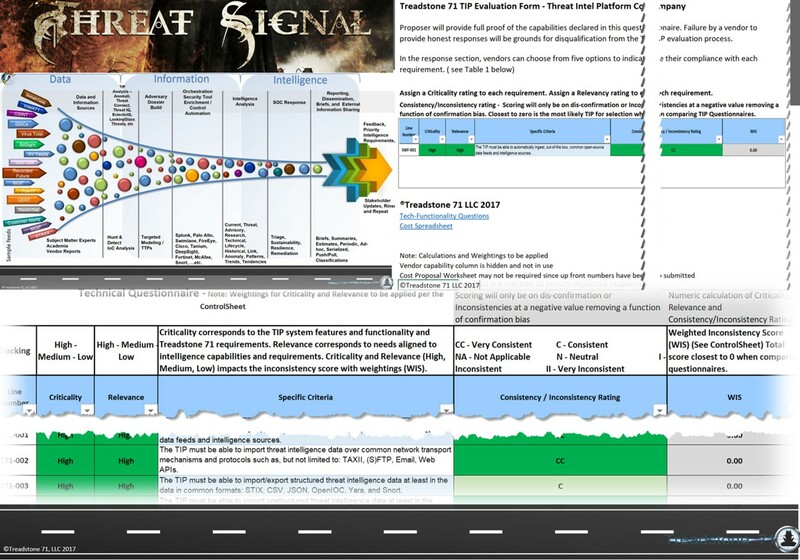 Nearly 8 years in the making, the Treadstone 71 Cyber Intelligence Maturity Model uses traditional tradecraft as delivered by Sherman Kent and Richards Heuer, intelligence community standards, analytic standards, and experiential knowledge derived from years of training, assessing, and building cyber intelligence programs. Analysts, who are subject-matter specialists, absorb incoming information, evaluate it, produce an assessment of the current state of affairs within an assigned field or substantive area, and then forecast future trends or outcomes. They integrate data into a coherent whole, putting the evaluated information in context, and produce finished intelligence that includes assessments of events and judgments about the implications of the information for your organization. Analysts are encouraged to include alternative futures in their assessments and to look for opportunities to warn about developments abroad that could either provide threats to or opportunities for organizational security and policy interests. Analysts also develop requirements for the collection of new information. From analysis, we move to analytic writing.